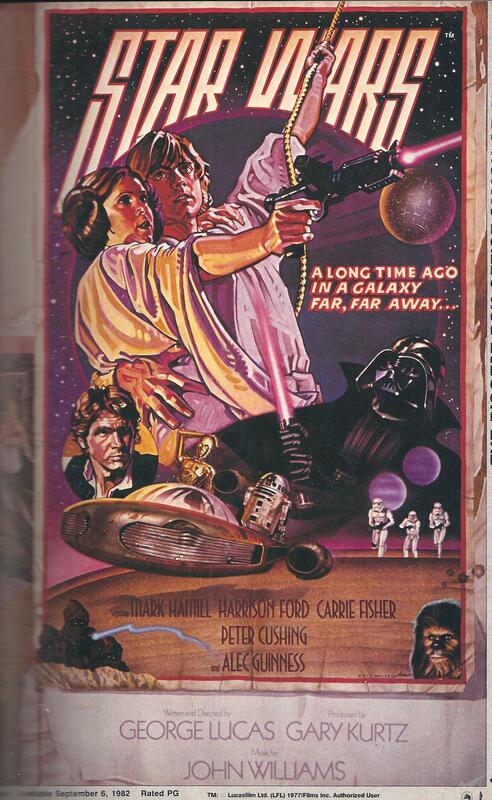 Today is the anniversary of the release of Star Wars. I was eight years old back in 1977, and had only been to the movies to see old Disney films that had been re-released. My mom had taken me, my sister, and my brother to go and see Dumbo or Bambi or something like that. But Star Wars was different, and in a very good way. My dad took me to see the movie, I suspect to keep him from having to see it by himself. The theater was packed, and everybody enjoyed the story of Luke and Leia and Han and old Ben Kenobi. The laser guns were almost a miracle of movie effects. The droids were funny and amusing. The Wookie was scary. And Darth Vader…where to begin? For a kid like me, Vader was the incarnation of all things evil. I still remember how it felt when Kenobi stopped fighting to let Luke escape. Vader swung into Obi-Wan and he just vanished. It has terrifying. But the fighting scenes at the end–where Luke destroys the Death Star–was just about as exhilarating as the movies ever got for me. Part of the magic–and that’s really what it seemed like– was me being a kid, but part of it was discovering, for the first time, how movies can create, and then draw you into, another world. In the days before VCRs and DVDs and even Betamax machines, this was a feeling that could only be recreated by seeing the movie over and over again in the theater. I didn’t do that with Star Wars, (the only movie I can ever remember doing that with was Raiders of the Lost Ark a few years later) but I would have if I was old enough to get to the theater by myself. I recently did some research on NASA for a project I’m working on. I learned that the number of applications to their astronaut training program spiked to their highest level ever in 1978, and I have to believe that Star Wars had something to do with it. If they would have taken an application from a kid like me, I would have done it too. The movie had that kind of an impact. So now, all these years later, May the 4th is now called “Star Wars day,” thanks in large part to social media. But the date when it was actually released to the world–which also just happened to be as school was letting out for the summer–is the best time to remember it. Every movie wants to capture some of what Star Wars had, but none ever has, or likely ever will. And remember, the Force will be with you, always.